It’s already almost that time of the year again… the weather is changing, the leavings are falling, the smell of cinnamon and pumpkin are in the air.. We are pleased to invite you to join us again this year for a Thanksgiving Dinner! Our fantastic chefs will be preparing a decadent three course meal. You’ll start your meal off with a delicious Butternut Squash Soup. Your second course will be our Harvest Salad (served only on this special occasion!) and for the third course.. You’ll get to choose from our Oven Roasted Turkey, Linguine Napoletana, Salmon, or Filet Mignon.. each prepared specially for the day. We will also be having drink and dessert specials for the day. Reservations are absolutely REQUIRED, and we always sell out for the holidays weeks in advance. Please, don’t delay in making your reservations. You may go online, here at MONKEYCAT.COM and click our “MAKE A RESERVATION” tab. If you have a party larger then 6 that you’d like to make a reservation for, please call the restaurant. 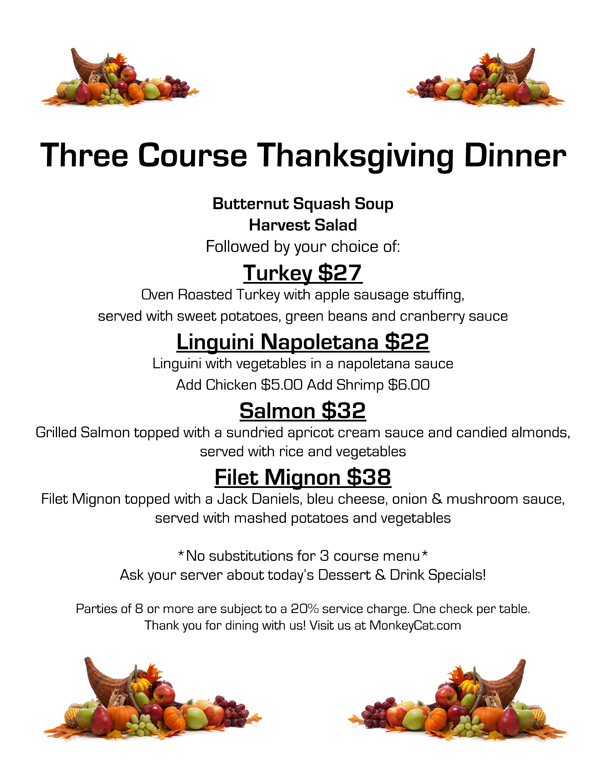 Treat your family & yourself to a fine dining experience for Thanksgiving. All of us here at Monkey Cat are looking forward to spending the holidays with you! 4 Replies to "Thanksgiving Auburn, Ca 2015"
I emailed your request to Jim! We will get your reservation set up and give you a confirmation call. Cheers! I would like to make reservations for Thanksgiving please. I would like reservations for Five (5) people for 6 PM (six pm) Can you e mail mail and confirm please. If you have any problems doing so, please give us a ring at the restaurant.